Children with obesity tend to be bullied more than their peers — and they’re more likely to have obesity as an adult, according to the Centers for Disease Control and Prevention. Nearly one in every five kids aged 6 to 19 in the United States has obesity, which is also linked with a higher risk for diabetes, asthma and heart disease. The facts are pretty grim, but California is helping its kids avoid these risks. A new healthy kids’ meal bill that goes into effect at the start of 2019 will prevent soda or other sugary drinks from being the default on all restaurants’ kids’ meal menus. Chains like Chick-fil-A and Popeyes currently serve their kids’ meals with a small drink — which is often filled with fountain soda — and the hope is that more healthful beverages, like water and milk, will take their place. There is strong evidence that links sugary beverage consumption with obesity; this bill is a simple play to thwart habits that lead to obesity in childhood and later in life. It’s a simple-sounding swap, but the mandate has potential to yield great change. “There’s lots of evidence in a wide range of fields that show people stick with the default. We make a lot of decisions on autopilot,” Margo Wootan, the Center for Science in the Public Interest’s vice president for nutrition, said in a phone interview. “You’re busy, you’re thinking about other things and defaults have a lot of influence.” Wootan added that parents, in particular, are often likely to choose the default option because mealtime ordering can be hectic and parents often have more pressing priorities. The country eats out more than it ever has in the past, and kids get about a quarter of their calories from restaurants. “Kids’ meals [and menus] are a powerful form of marketing,” Wootan said, because they set a standard for what kids “should” be eating. Children’s meals don’t have to come with a soda, nor do they have to be nutritionally void. “It’s from the billions of dollars in marketing that kids are exposed to year after year that cultivate the norm we have in the U.S. that kids food is unhealthy,” she continued. 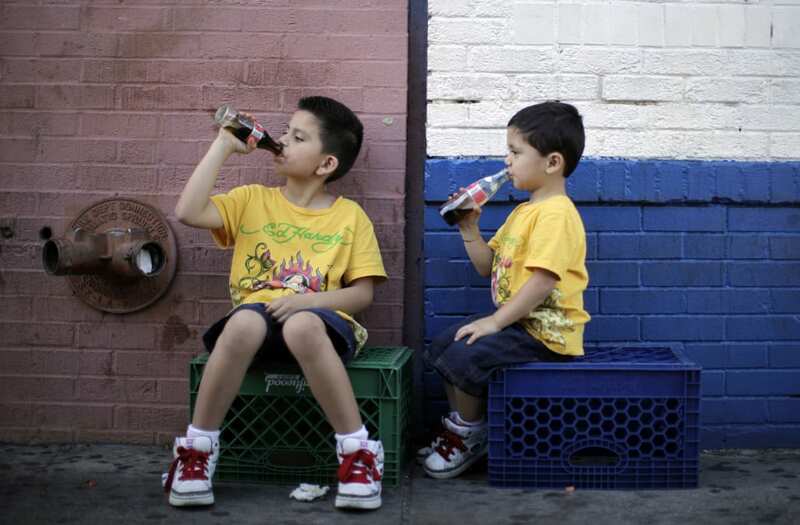 Soda drinking is not the only habit linked to obesity, but it’s low-hanging fruit to incite legislation like California’s, since the public has generally accepted soda as unhealthy. In 2016, bottled water surpassed soft drinks as the top-selling beverage in the U.S.: It was the first time soda did not place in that top spot. Americans are increasingly showing a desire to get healthier, and the laws are slowly adapting along with them.